A Few Words of Inspiration for My Sales Team | Avcomm Solutions, Inc.
My favorite breakfast place is two blocks from where we’re renting a flat, called Anna Blume. It was introduced to me by a Berliner friend 3 years ago upon a visit for business, and situated in the old East Berlin neighborhood of Prenzlauer Berg. The coffee is good, and the bauernomelette (think of pickles, potatoes and eggs) is my favorite. When there alone, I find myself quite contemplative. I go there weekly to write. 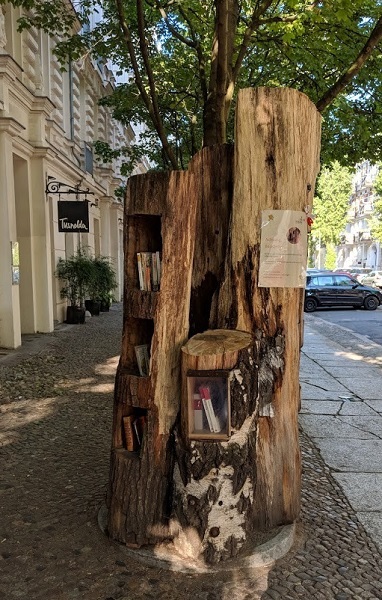 My favorite table faces west, and right in front of this table on the street there is the most interesting old tree that has been transformed into a potent symbol of the communal and trustworthy nature inherent in German society. I usually sit there any hour and half, eating, writing, and — like a shoddy Balzac — (at least in my mind) drink a few coffees. In that scant hour and a half of that day of the week, I see all manner of people come by, and with a frequency that astonishes. I’m there for just 90 minutes, but I must see 7 or 8 people come by in that time. That one craftsperson, with this simple idea of a book exchange, has now impacted thousands of lives. Do the math: I’m there for just 90 minutes one day a week; how many weeks, months and years has the tree been delivering thought-provoking texts, giving pleasure to people as they read something fun, or providing much needed distraction to someone that maybe in some form of distress or crisis. The enormity of the aggregate of instances of influences on those people using the tree, created by that one craftsperson who created it, can probably never be calculated or known. It was this realization that led me to interpret the value of the tree as a potent reminder to my sales people. For you shall never know what little action you may have done months ago, when interacting with another little action (of yours or another), and how, when those actions combine, may finally be the spark needed to advance your goals. That spark is what results in your prospects finally sending the “let’s catch up” email or “It’s time for us to get serious about this” email. Or even, in this day and age, that rare phone call. So, I say this to all those salespeople out there who maybe struggling with the day-to-day repetitive nature of sales (and to my sales team): You are that craftsperson. You are creating that tree where you and others come to exchange ideas. Your job is to help your prospects take a little idea from you, one from another, and combine them until those ideas create something of value for your prospect (which hopefully is what you’re selling).